Sault Ste. 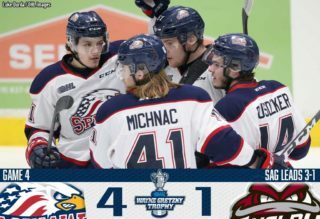 Marie, ON – The West Division champion Saginaw Spirit fell in the last game of the regular season, 5-2 on the road against the Soo Greyhounds, Sunday at GFL Memorial Gardens in Sault Ste. Marie, Ontario. Rookie Tristan Lennox made a career-high 47 saves to collect first-star honors in a losing effort. Soo native Camaryn Baber collected his eighth goal of the season in his hometown. Overager Albert Michnac scored a goal and assist in his final OHL regular season game of his career. The Western Conference’s second-seed Spirit take on the seventh-seed Sarnia Sting in the first round of the Ontario Hockey League (OHL) playoffs. Lennox was tested early when Brighton, Michigan native Keeghan Howdeshell skated into the Spirit zone on a one-on-one rush. The rookie goalie covered the angle well and made a strong pad save in the opening minute of play. Lennox stoned rookie Rory Kerins on a point blank wrist shot from the right face-off circle with a pad save after the Greyhounds left-winger made an inside-out move around a Spirit defender. Saginaw’s Brock Hill had a great opportunity to open the scoring for the Spirit with just under five minutes remaining in the first period. The Spirit defenseman took a wrist shot from the top of the right face-off circle that was denied by Greyhounds rookie goaltender Ethan Taylor. The game’s first goal came with just under three minutes remaining in the first when the Soo’s Tye Kartye’s fourth goal of the season. It took a perfect shot from the right face-off dot by the left-winger to beat Saginaw’s net-minder Lennox. The Soo took a two-goal lead on a two-on-one rush after a perfect backdoor pass from Jaromir Pytlik over for Zack Trott to tap into the Saginaw net. Former Detroit Red Wings draft pick Jordan Sambrook extended the Sault Ste. Marie lead to three at 4:23 of the second period. Sambrook received a drop pass from Joe Carroll at the top of the right circle and put a wrist shot top shelf for the defenseman’s 17th goal of the year. Trott collected his second goal of the game just 30 seconds after the Sambrook goal to make it 4-0 Greyhounds. 2017 Philadelphia Flyers first round pick Morgan Frost set up Trott in the slot with a backdoor tap in. The Greyhounds made it 5-0 just over 11 minutes into the second period with Drew Wawrow’s first career OHL goal. The former Sudbury Wolves draft pick sent a wrist shot top-shelf from the Spirit slot. 2019 NHL Draft prospect Trott contributed his third point of the game with the primary assist on the Wawrow goal. Minnesota Wild prospect Damien Giroux nearly put the Spirit on the board late in the second period on the breakaway. The Saginaw captain just missed the Greyhounds net high with his wrist shot. Despite the score, Lennox played hard and made several big saves. The rookie goaltender denied Kartye’s tap in chance after a nice back door pass from Frost. Lennox dived across the crease with a great desperation save. The Greyhounds outshot the Spirit, 34-22 through two periods of play. 2017 Florida Panthers 10th overall pick Owen Tippett nearly scored the first of the game for Saginaw. The right-winger rang a wrist shot off the post in the opening minute of the final frame. Overager Albert Michnac broke up the Taylor shutout bit 2:37 into the third period. The Czech forward created a turnover in the Soo slot and roofed a backhander over Taylor’s shoulder for his 20th goal of the season. 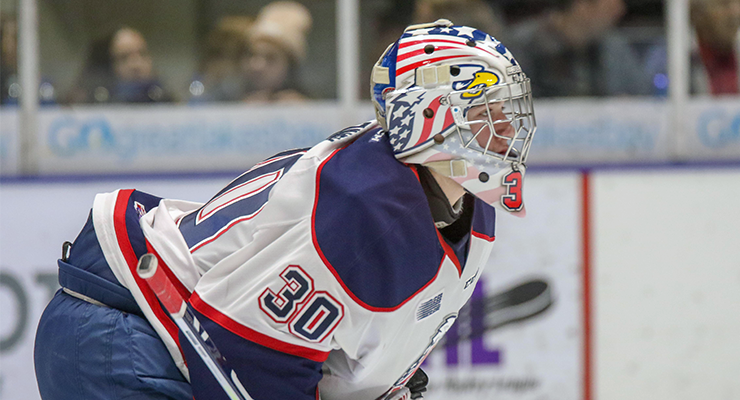 The Spirit’s power play struggles continued going scoreless in three opportunities in the game. Saginaw is without a goal with the man-power advantage in their last six games. Sault Ste. Marie, Ontario native Camaryn Baber notched his eighth of the season in the final minute of the game. Michnac sent a nice pass to spring Baber all alone in the slot. The Spirit center made a nice deke to the backhand and slid the puck around Taylor to bring the Spirit within three goals. 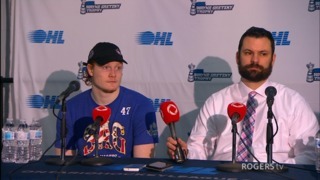 Michnac collected a goal and assist in his final OHL regular season game. 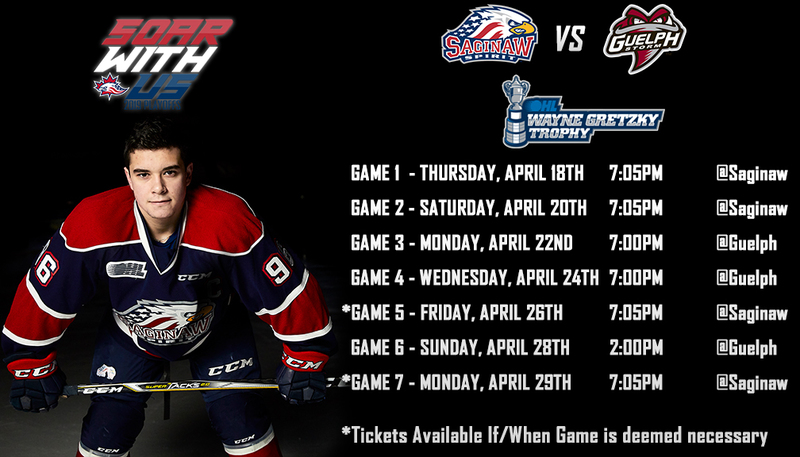 The Western Conference second-seed Saginaw Spirit’s post-season begins with a first-round match-up against the seventh-seed Sarnia Sting. Game one is set for a 7:05 p.m. puck drop on Thursday, March 21 from The Dow Event Center. Saginaw had the regular season edge head-to-head, 3-2-0-1. Watch live on OHLLive.com or listen live on the flagship WSGW 100.5 FM Talk and Sports and fmtalk1005.com with the voice of the Saginaw Spirit Joey Battaino and Dennis Desrosiers on the call. “Countdown to Faceoff” with host Domenic Papa starts 15 minutes prior to puck drop. Game two will be held Saturday, March 23 from The Dow at 7:05 p.m. Tickets are on sale for both playoff games. 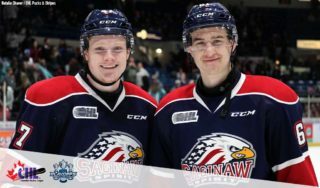 To purchase tickets to any Saginaw Spirit home game call (989) 497-7747, visit saginawspirit.com, or by visiting the Saginaw Spirit Store at 5789 State Street, Saginaw, MI.